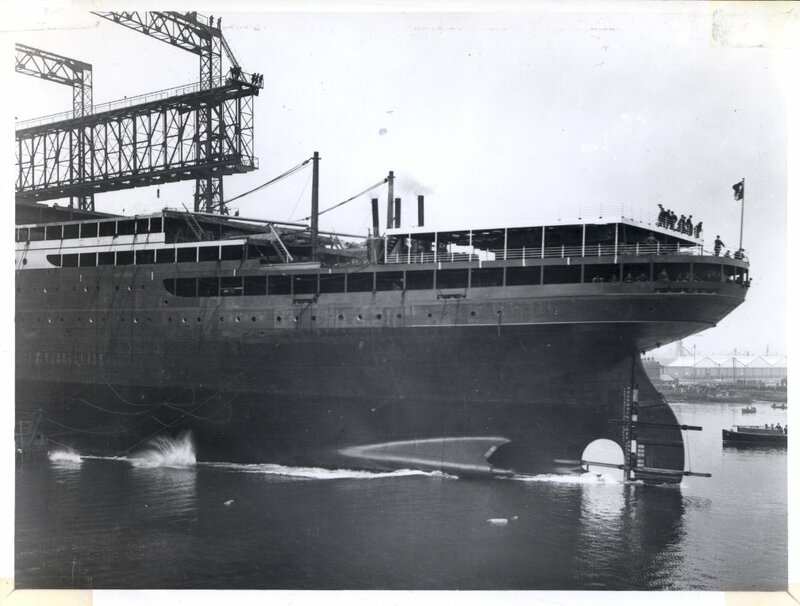 Laid down in 1912 and launched in 1914, Holland America's Statendam II was unfinished when WW I broke out. She sat, unfinished, at Harland & Wolff until 1915, when the British government requisitioned her and work resumed. 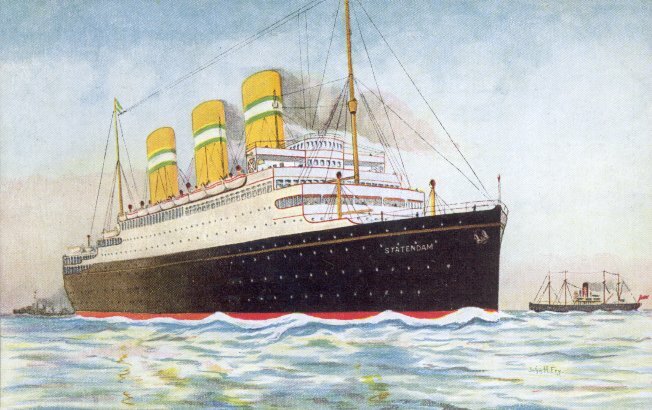 She was completed in April 1917, and was initially intended as the replacement for Lusitania; thus the Cunard-sounding name, which means "justice" in Latin. Cunard, however, had trouble putting together a crew, while White Star had Britannic's crew easily available. Thus, the ship was put under White Star management (the Government still owned her) rather than Cunard's. She was never painted in any line's livery. When delivered she was painted gray, and in 1918 she was repainted in dazzle. On 19 July 1918 Justicia was torpedoed three times by UB 64 off Skerryvore, Scotland, without sinking, and was taken in tow to Loch Swilley. The next day, though, she was torpedoed twice more, by UB 124, and sank. 16 engine room crew were killed. Later in the day, UB 124 was herself sunk by the destroyers "protecting" Justicia. A Royal Navy inquiry was held into how Justicia, escorted by at least three destroyers, was torpedoed five times within 18 hours, each time in daylight. It concluded that the determination and bravery of the U-boat crews was "beyond belief." After the war, Holland America was compensated for Justicia's loss with 60,000 tons of steel. Sources: Williams and de Kerbrech's Damned by Destiny; Haws' Merchant Fleets; Williams' Wartime Disasters at Sea.